A new update is coming to Red Dead Redemption Online next week featuring an event based on the armor quest in the game, competitive fishing, new weapons, cosmetics, and of course some good old fashioned Bonus XP. 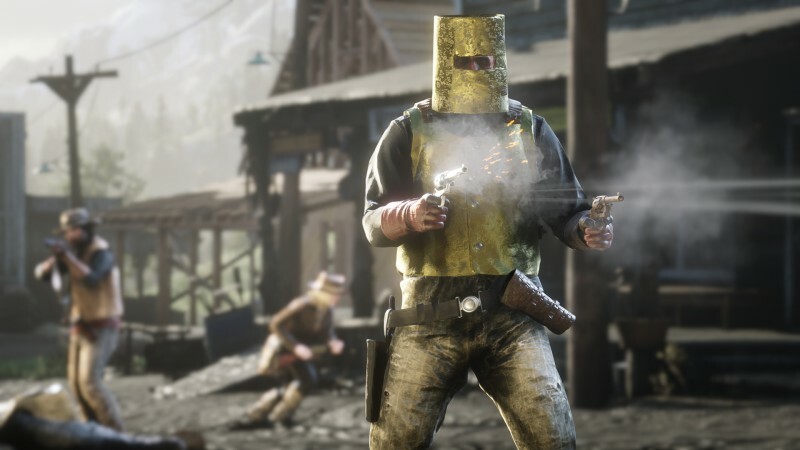 The first new addition, Fool's Gold, takes the armor story quest from Red Dead Online and makes it into a multiplayer free roam event. Players fight to control a set of golden armor, then don the armor themselves to see how long they can hold onto it. It's basically a king of the hill mode but you're Solaire. There's also now fishing challenges. Once you opt in, the game supplies you with everything you need to go get some fish except for the necessary human skills to go do it. Prove your mettle by catching the biggest fish the old west has ever seen. As part of the PS4's content timed exclusivity, if you're playing Red Dead Online on the Sony system, this update will bring you open target races, where you compete to take out a target on horseback, and a new melee weapon called the Jawbone knife. Usually exclusivity windows are only about 30 days. The update launches on February 26, but you don't need to wait for it to launch to be productive. Until the update lands, all players get 20 percent bonus XP before it launches, so you can be nice and prepared to be the armor king the world needs right now. You can find a full list of what the update contains right here.